Sometimes, when you're sitting at your desk, all you want are some piping-hot baked beans. Hey, we all know it, why not admit it? That's why Heinz is working on a USB beans microwave. No, this isn't a joke. The Beanzawave—yes, Beanzawave—is billed as the world's smallest microwave, measuring just 7.4 inches tall by 2.6 inches wide and 5.9 inches deep. 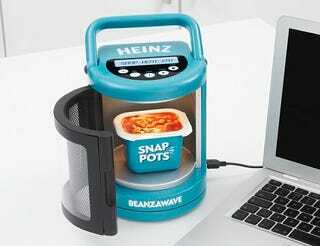 It's perfect for desktop bean cookery, and Heinz is even dabbling in Lithium Ion batteries for on-the-go beans heating. Amazing.